A thoroughbred trail slayer. 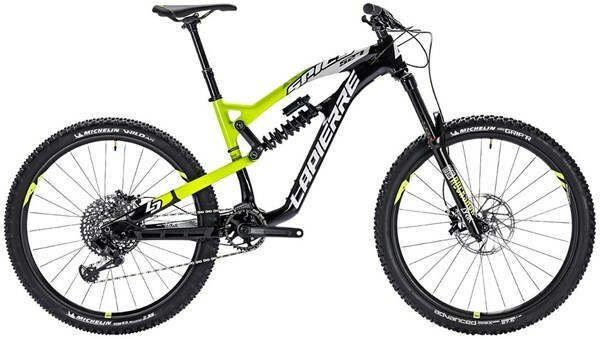 The Lapierre Spicy 527 is an enduro mountain bike that has been tried and tested at the very highest level and has challenged for the top spot on the EWS. Push your limits on the most challenging trails with the Lapierre Spicy. Our full-suspension model designed for endurance uses. Developed in collaboration with the sport’s best riders, the Spicy has shined on the Enduro World Series circuit with Adrien Dailly, current world champion, in the saddle. During descents, with its 165 mm of clearance and unique geometry that plays to the rider’s dexterity, the Spicy is capable of absorbing it all at high speed. While climbing, the OST+ suspension kicks in for optimal pedalling efficiency, allowing you to save a maximum amount of energy during transitions. This bike will fully prepare you to attack any slope on your terms, regardless of its direction. The Spicy, served up with a carbon sauce! A composite frame creating an unbeatable weight / stiffness trade-off, and OST+ virtual pivot point kinematics, providing incomparable steering without generating any pumping. Support welcomed in the form of a RockShox Super Deluxe Coil spring shock absorber, which is more sensitive and resistant to heating than an air version. Its RockShox LYRIK RC fork mount will provide all the comfort needed to withstand even the most demanding trails. Its Sram GX Eagle transmission and 10-50 cassette will ease any type of climb thanks to its wide gear ratio. The Spicy 527 comes with Lapierre AM wheels developed specifically for an endurance-based use, with inclusion of straight spokes on the transmission side for maximum reliability and optimal efficiency. Rolling on MICHELIN 2.35 WILDGRIP'R2 ADVANCED and WILD AM COMPETITION tires, you’ve got all the equipment you’ll need to take on any trail completely relaxed.